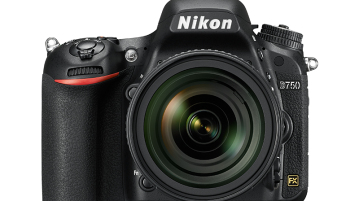 Behind the Campaign: Rational Animal | SHARPEN - Photography News, Business, Art Happenings, Equipment Reviews, and more! Portraits of residents who live in Queens, NY who have had their pets spayed or neutered. photo campaign for Rational Animal and the Mayor's Alliance of NY. Several years ago in New York City, I was introduced to the founder of Rational Animal, Susan Brandt. Rational Animal has been using media for over ten years to create public service announcements that promote comfort for animals in shelters. I have been an animal lover my whole life, having had cats, dogs, rabbits, horses, fish and lizards, and thus offered to work with them as one of their volunteers. One of their major ongoing projects is the Mother’s Comfort Project. Funds are raised to be used for the manufacture and distribution of toys and soft bedding for cats and dogs in animal shelter cages. 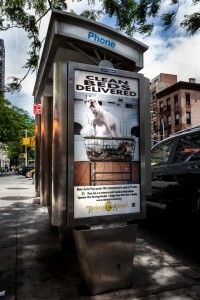 Phone Kiosk in Manhattan with the Clean Beds Delivered campaign around NYC and the boroughs featuring Coco, a French Bulldog. Photo by Salem Krieger. The Rational Animal “CLEAN BEDS DELIVERED” PSA campaign was created to raise awareness about sheltered dogs and cats, and serve as a call to action. I worked with a designer who is also a volunteer for RA on the campaign. My neighbor’s French Bulldog was used as the model and was photographed in my building’s laundry room using Profoto strobes, softboxes, and reflectors. 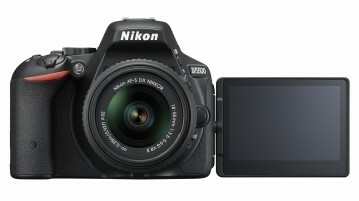 At that time, I was using Nikon D2X tethered to a Mac Book Pro. Coco, the dog, was fun to work with because he was very responsive. He was sitting in the laundry basket and I kept talking to him and encouraging him, saying “Come on boy!” He would look at me and eventually put his front legs on the edge of the laundry cart. I only had a few moments with him in that position, but managed to get Coco balanced there with the right look in his eyes. The PSA posters were distributed throughout the boroughs of New York on telephone kiosks supplied at no cost by Van Wagner of NY. The campaign’s goal was to photograph people from the boroughs of Queens, Brooklyn and the Bronx with their pets at key landmarks in the each borough, to make the campaign feel familiar to residents in the selected areas. Each kiosk poster was given the same title but with their borough: “We Did It in Brooklyn”, “We Did It in Queens”, and “We Did It in the Bronx.” Once we secured funding with the Mayor’s Alliance for NYC’s Animals, I set out to find models. My main assistant was paid for her time on the project, and acted as my producer. We set up casting calls in the Bronx, Brooklyn, and Queens. 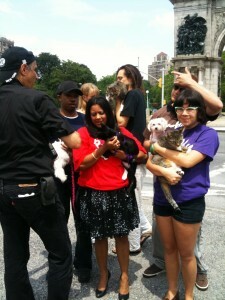 We only requested people who had adopted a cat or dog from their borough NYC animal shelter. Their animals had to be spayed or neutered, which is standard policy for all of the NYC animal shelters. This is one of the key methods of helping to keep at-risk homeless animals from growing in numbers. Photo shoots were held at the 1964 World’s Fair Unisphere (Queens), the Prospect Park Arc de Triomphe (Brooklyn), and inside Yankee Stadium (Bronx). 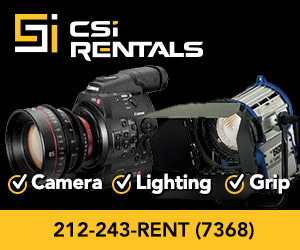 Once we completed our casting for Brooklyn, Queens, and the Bronx, we set up dates for the shoots. This involved getting permission from the NYC Parks Department to photograph in Brooklyn at Prospect Park. Fees for park security, which is required, also had to be paid to the Parks Department. We also had a location van (donated) in which to prep our models. Make-up artists, animal trainers, and general assistants all volunteered their time to help us out. We received permission from the Queens Parks Department to shoot at the World’s Fair. The Queens Museum was very helpful, and offered us space to set up right by the Unisphere. Again, volunteer make up artists, a donated location van, and general helpers willing to contribute their time were critical to our success. On Location shooting the campaign. On the day of the shoot, we had major storm clouds, but we decided to shoot anyway. Too much effort had gone into organizing the shoot that day to cancel. I later had a retoucher replace the heavy overcast sky with one of my sky photographs. In the Bronx, we shot at Yankee Stadium. I had to meet with the marketing agency for the NY Yankees to secure permission for the shoot. It had to be on a day when the Yankees were out of town. I asked about shooting on the field with the models and animals, but was told they do not allow any shoots on the playing field. We walked around the seating areas and decided on a location there that would work. On the day of the shoot, however, we were told we could not use that location, and thus had to act fast to secure another location. The most difficult part of the shoot was the weather. It was very hot and humid. Neither cats nor dogs nor humans enjoy these conditions. It was a very good exercise in learning how to work with amateur models and animals in difficult conditions. The volunteer team consisted of about 10 people, and they were a great help. They managed all of the logistics so I could focus on the shoot. On all three locations, I used Profoto portable battery power packs, Lumedyne portable power strobes, and my Canon 5D MarkII with a 24-70mm lens. 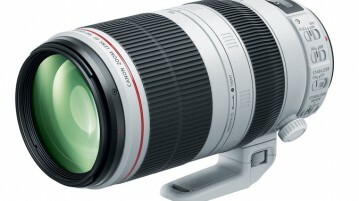 Initially, I tethered to a Mac Book Pro, just to get my bearings, but then switched to shooting untethered. Lastly, I participated in the Sweet Dreams PSA campaign. 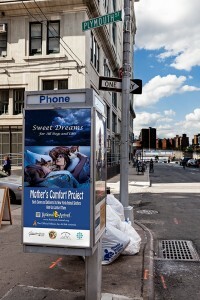 The focus of the campaign was once again to promote the Mother’s Comfort Project. We had no budget, and thus I ended up photographing inside my apartment. There were about 10 people, all volunteers, once again. A professional model worked with us this time around. 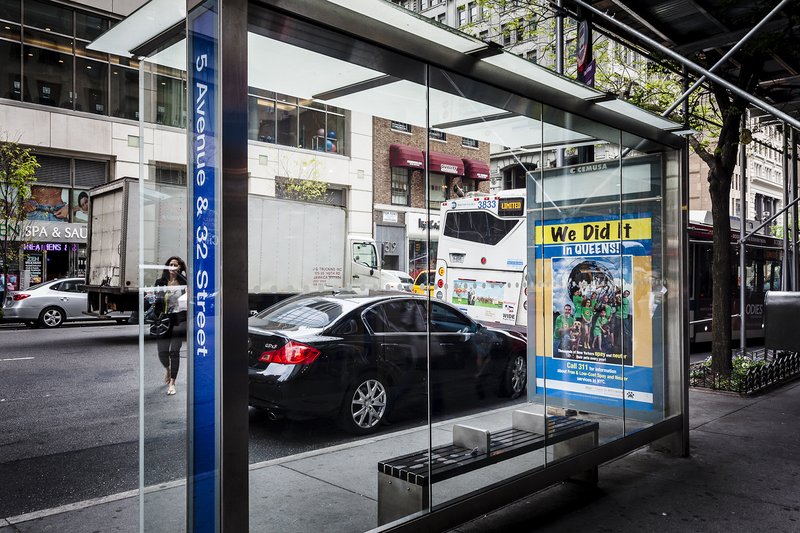 All of the printed PSA posters were placed on bus stop kiosks and telephone kiosks throughout Manhattan, Brooklyn, Queens, and the Bronx, again supplied at no cost by Van Wagner of NY. To this day The Mother’s Comfort Project has delivered several thousand toys and beds bringing a small amount of comfort to NY shelter animals who would otherwise spend all of their time in a hard metal cage. I had a great experience volunteering with Rational Animal, and would highly encourage anyone with a cause they are passionate about to inquire and see if they can volunteer as a photographer, as I did. It was great to work with an organization that loves animals as much as I do, and to be able to put my photographic talents to use to support a good cause!